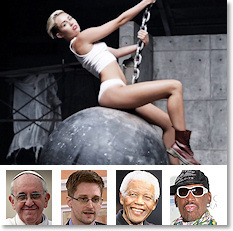 Trendsetting twenty-something beats out Pope Francis, Edward Snowden, Nelson Mandela, Dennis Rodman. Look for several R-rated movies about current period of greed, decadence sometime in next decade. Michelle says she hasn't seen him in days.